Please post any questions/issues relating to this docker you have in this thread. If you are not using Unraid (and you should be!) then please do not post here, instead head to linuxserver.io to see how to get support. I'm having some problems with the Path Mappings that I cant seem to be able to figure out. I had this working with the dockerhub-version but when I changed my cache-drive something screwed it up so I decided to reinstall using the CA-template but I'm obviously doing something wrong since I keep getting "This path does not seem to be valid" on everything in Bazarr. I think this is how I used to have it but I could very well be wrong, I tried a couple of different variations but no luck. 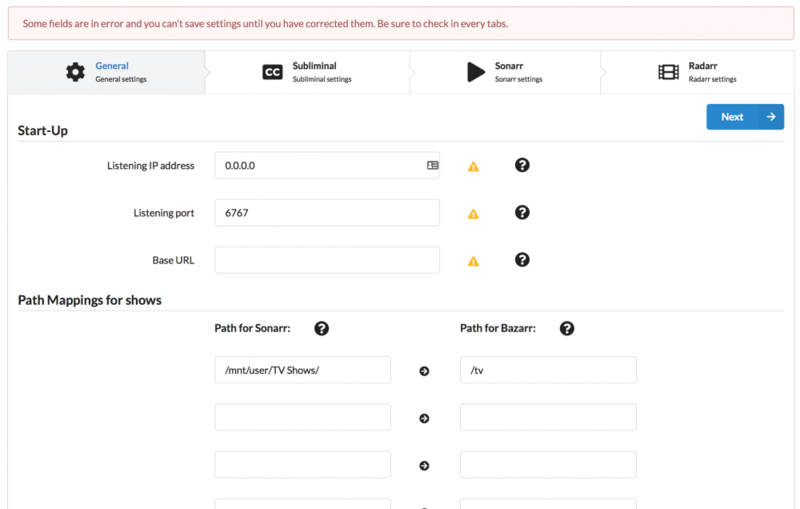 You have to point the Path Mappings for Sonarr and Radarr to the same path as configured in the container's options! Therefore replace "/media" to "/mnt/user/Movies" for Radarr and "mnt/user/TV Shows" for Sonarr. Therefore replace "/media" to "/mnt/user/Movies﻿﻿" for Radarr and "mnt/user/TV Shows﻿﻿﻿﻿" for Sonarr. I tried that and it still says "This path doesn't seem to be valid" on all the files in the Series and Movies tab, any ideas? I don't think it should, since I have had this working with the same shares before. And besides, I get the same error on the movies-tab. Your paths are wrong. The easiest way to fix this is A) Find the correct paths and B) Delete the Bazaar container & it's appdata folder and start again (I discovered that in some cases, changing to the correct path doesn't always work if it's already logged the wrong one and it was easy to just start over). Step 1) In the Bazarr container note Host Path 2 and 3. You'll link 2 to wherever your movies are, like /mnt/media/movies and 3 to tv, like /mnt/media/tv. Note these are *not the paths you use in the applications! * Like all containers, this just maps to an internal container path. *That's* what you use. For the Unraid Bazarr container Movies are mapped to /movies and TV mapped to /tv. Note the case! It is case-sensitive. Inside the container itself that is where Bazarr sees the content. You can easily test this by opening up a console shell for the container and cd'ing to /movies and /tv - if you mapped this correctly you'll see a list of your respective files in each. 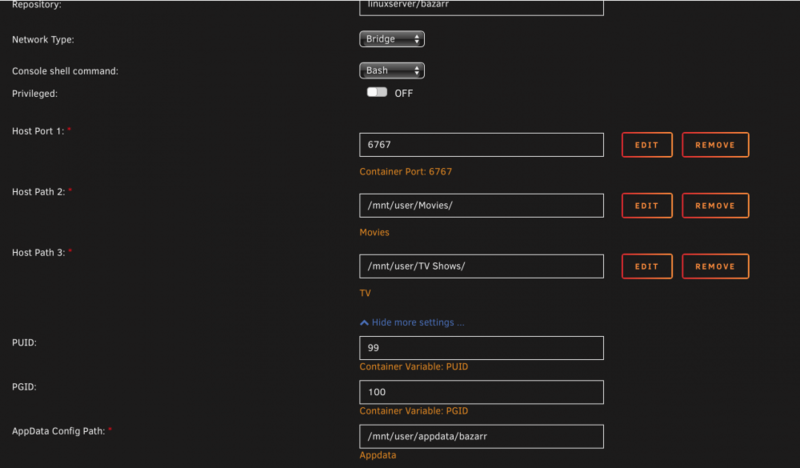 Step 2) You need to use the same *container* path for Sonarr/Radarr - the ones those containers are using. For example, Binhex-Sonarr/Radarr maps your directories to /media for those containers. So /mnt/media/movies (if that is your actual Unraid path) is mapped to /media inside the Radarr container, and so on. Step 3) Use the respective container path mappings in Bazarr. 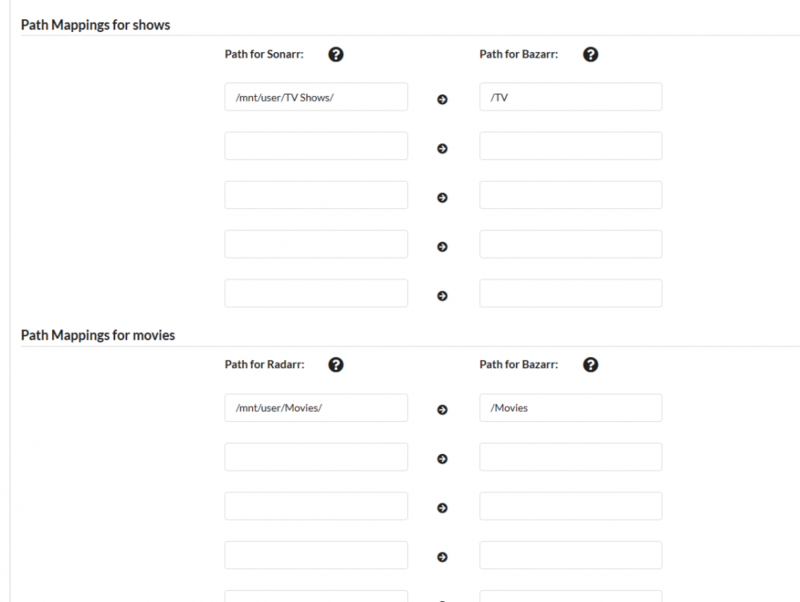 In the above example, you'd use /media for both the Sonarr and Radarr path (left side) and /movies for Radarr /tv for Sonarr for the Bazarr mapping (right side). Obviously you need to use the actual paths you are using. Quickest sanity check is just to open a console shell for all 3 containers and cd/ls each container path. That will insure you are using the right ones. This probably seems obvious but I know sometimes container paths, especially when using containers from different sources, can get confusing, and the Bazarr instructions are somewhat unclear at the moment. Last tip: After you get it working and Bazarr correctly scans all your shows/movies (it can take a bit) you can mass-edit the list and choose the languages, or language, you want to apply to them. Then do a sync (or wait for it to kick off on it's own, it's scheduled) and it'll be able to show you what you have and what's missing. I have this working and downloading subs for my movies and tv shows. It is quite handy, actually. Plex users can use the SubZero plugin but Emby users like myself have been stuck with the built-in Opensubtitles support which is pretty lacking. Bazarr lets you use more providers by leveraging Subliminal, which is what SubZero leverages as well and is one of the better, if not best, subtitle matching apps around. It appears I initially thought right in using the specified host paths but the template showed them wrong. When I bashed in as you suggested I saw that TV is actually tv and Movies is actually movies. Maybe the template should be updated so others don't make the same mistake? Got it working now anyway, thanks for your help! Since it's happened to at least two of us I agree that perhaps the container should be updated to correct this minor, but important, typo in the description. It is an easy thing to overlook. BTW thanks a LOT LSIO for creating this container, the above issue aside it makes it a lot easier to install Bazarr than trying to do it manually and Bazarr itself is a great app. Plex may have the SubZero plugin but Emby users like myself needed something like this which also leverages Subliminal. Yes it's a great application, and it's great for Kodi-users as well so we don't have to download every subtitle separately even though Kodi handles that part a lot better then Plex. Thanks for this. Do you know if it is possible to add multiple source folders, without error? I am having some trouble getting this to work properly. I read the preceding posts about paths and feel sure that I have them correct. My problem is that when I have done the general settings page in the UI as well as the Subliminal page, I am left with a "Loading page" that just seems to be stuck. Note that I am not using Radarr which is why there are no entries for that in the UI, but only in the docker template (as I didn't want it to throw an error if it was missing. Additionally, I've had limited success with SubZero for subtitles and Plex will be removing the plug-in system soon, if not already. Plex recently integrated subtitles search natively but I have yet to try it. I'm looking forward to trying Bazaar first. How long does it take to start the docker? It's been a few minutes since I installed it and I still can't access the webui. The log it stuck on "Bazaar starting...". I know a few of the other linuxserver images take a while to start up the first time but those have a lot of activity in the log. It's been over 10 minutes. Thanks, that fixed it. The template probably needs to be updated. I did notice on the last screenshot you don't have Sonarr enabled (use Sonarr). I doubt that's causing the issue though. Additionally, one of your paths in the screenshot for Sonarr doesn't have a "/" at the end. Believe it or not, I've had programs break before because of that (sloppy programming IMHO). That might be an issue here. Edit: I'm pretty sure that's it because I removed the trailing slash from one of my paths and now it's freaking out about invalid paths and instead of /movies/movie_name it's showing /moviemovie_name. I'll submit a bug on the project page. Again, sloppy programming. Add a trailing slash and that should fix it. Btw, the template also didn't suggest bridge or host for network mode for me, so I manually chose bridge. Is this working for anyone? I installed the docker. The WebUI is accessible and I've set up the config, got reverse proxy working too. 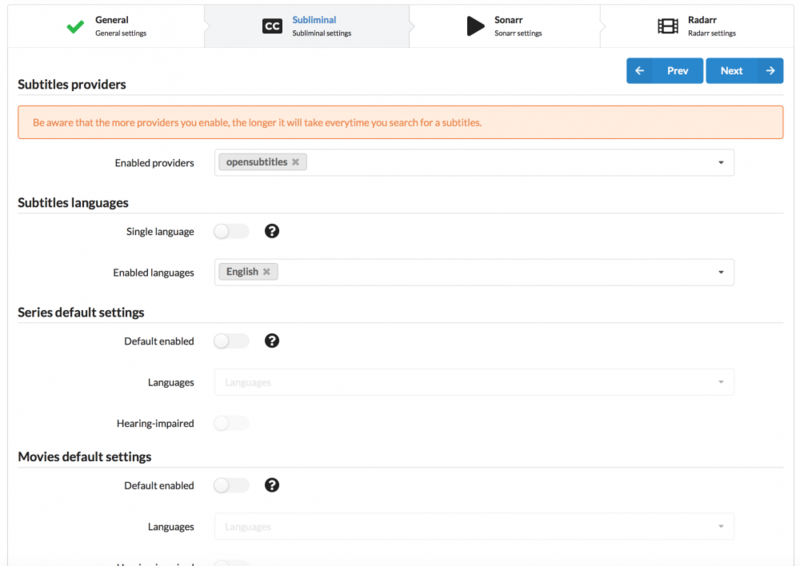 The Wanted list now shows 2,593 missing subtitles. But nothing is downloaded since last night. Tried a new docker install, tried to trigger it manually. BAZARR Finished searching for missing subtitles. Check histories for more information. I went into the Wanted list and manually triggered searches for 3 episodes. Bazarr found them and I can see the SRT files on the server. But the WebUI still has the episodes in the Wanted list and Badge number shows the same. So it looks like Bazarr works when manually searching individual episodes but isn't recognizing the ones it found, and the bulk download doesn't seem to be working for me. I was talking to one of their devs on Discord and we were trying to find the bazarr/static folder but I don't see it in mine. All I have are /config, /db, and /log. Where is the /static folder? Maybe this is related to my earlier question. Ok one of Bazarr's dev halali on Discord figured it out. I had to leave the path mappings EMPTY in Bazarr's settings. I'm really curious if anyone has ran into the same problem because all the Bazarr discussion I've found emphasized getting the paths mapped correctly. Is this doing double duty because the paths were already mapped in the docker setup? I tried this and I am still having issues. I tried the posted configs above and still cannot get bazarr to recognize my mappings. What are you using? RROR:root:Error trying to get releases from Github. Connection Error.